Welcome To The Cotswold Soap Co.
Based in the Cotswolds we began making soap for family and friends in our kitchen surrounded by our children and pets. As demand grew we soon realised that things were starting to get in the way, so in 2014 we moved into our workshop and The Cotswold Soap Co. was born! At The Cotswold Soap Co. we pride ourselves on the quality of our handmade cold processed soaps and can ensure only the finest ingredients are used. Our soaps are never tested on animals, they are however tested on our family, friends and children (who are lets face it our toughest critics as you can imagine). Our soaps have also been tested by Scott Grainger CSci CChem MRSC and comply to all current EU standards. We are also proud members of The Guild Of Craft Soap & Toiletry Makers. The business is going from strength to strength, we were recently awarded the #SBS Theo Paphitis small business award in November 2014. As all of our soaps including our Black Pepper & Sandalwood range are hand made on site individual bars may have slight differences and imperfections, but that’s part of what makes them so special. If there is a particular soap you are looking for and can’t see it listed, please let us know and we can add it to our wishlist. The different oils that go into our soaps all have different features and benefits, coconut oil can help to fight acne breakouts and recover damaged skin, whats more it produces all of the smooth little bubbles we love, olive oil is excellent at nourishing and relieving dry skin, rich in vitamin E and beta carotene it stimulates new skin generation and can give skin a youthful appearance. 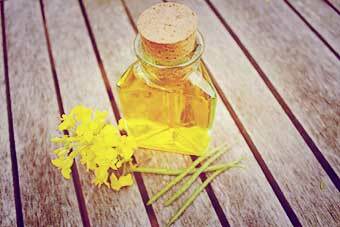 The Canola oil or as its more commonly known “Rapeseed” oil that we use in all of our soaps is grown in the fields that surround our workshop, it is then turned into oil on a small farm down the hill just five miles away. The rapeseed oil that we use is rich in vitamins E and K which can help reduce the signs of ageing such as fine lines, wrinkles, blemishes and spots. One teaspoon of Rapeseed oil contains about 15% of the daily recommended value of vitamin E. Every soap bar we produce contains just under seven teaspoons! All of our packaging is kept to a minimum and carefully selected, ensuring we remain as eco friendly as possible. 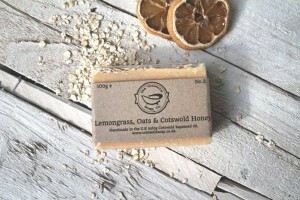 At The Cotswold Soap Co. we always attempt to reuse any packaging we receive while fulfilling our orders. This enables us to keep costs down while doing our bit to help save our small planet. Any packaging we deem unfit to reuse is then recycled. We encourage you to keep the chain alive by doing your bit too. You can stay up to date with our soaping adventures on Facebook, follow us on Twitter, see the world through our eyes on Instagram and check out what we’re up to on Pinterest.